A couple of days ago Quinton and I came home from our early morning walk super hungry and ready to throw down some pancakes for breakfast when I discovered I was out of some ingredients to make them. I was not happy. I started digging through the pantry and came across a box of French Vanilla cake mix and the idea hit me that I could make pancakes out of cake mix! I know this is nothing new to some folks…I’m just a little late to the party. I don’t know about you, but I usually have a cake mix on hand. The flavor possibilities are endless! Spice cake mix with pumpkin would be great. Banana Nut using vanilla cake mix, Lemon cake mix with almond flavoring and poppy seeds, Strawberry cake mix with strawberries and syrup…yum! The kids were so excited when they saw me making cake for breakfast and were ecstatic to see me stir in sprinkles. What is it about sprinkles? I guess all the pretty colors make me excited too. I decided to deem them healthy…I mean really, what’s the difference between pancakes and cakes made on a griddle. And whats the big difference between pure maple syrup and powdered sugar glaze?! These would be perfect for birthday breakfasts or any fun occasion. 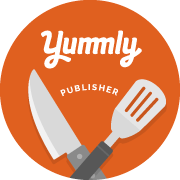 I can’t wait to make chocolate cake mix pancakes…the possibilities are just endless! In a medium bowl, whisk together flour and cake mix. Stir in milk, eggs, oil, and vanilla and mix to combine. Lightly stir in sprinkles. Preheat an electric griddle to 300 degrees. When heated, spray lightly with cooking spray and ladle about ⅓ cup batter onto the griddle. Carefully turn when edges are light golden brown. Continue cooking on the other side until the center springs back when lightly dented with finger. 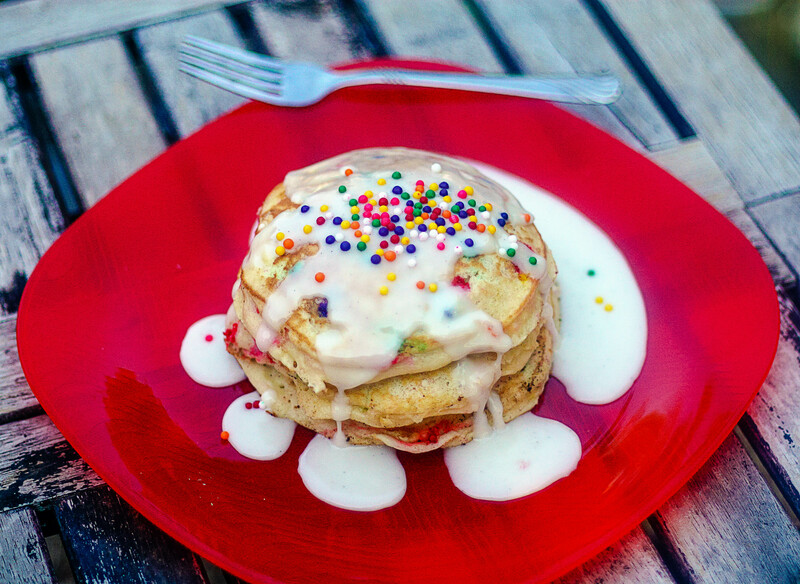 Serve warm, drizzled with powdered sugar icing and lots of colorful sprinkles! For Icing: In a small mixing bowl, combine powdered sugar, milk and vanilla extract and whisk until smooth and lumps are gone. You may need to adjust the consistency with more sugar or more milk, depending on desired thickness. 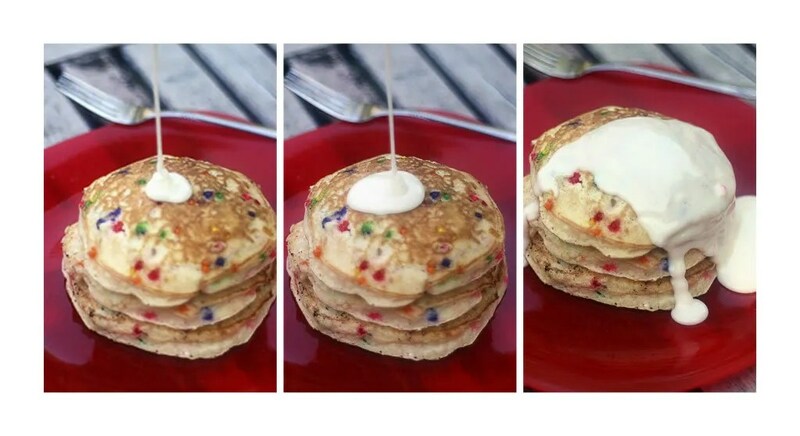 Drizzle onto warm pancakes and top with more sprinkles, if desired.